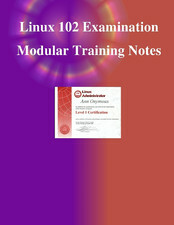 This course material is based on the objectives for the Linux Professionals Institute's LPI 102 examination (specifically, release 2 of the objectives). The course is intended to provide you with the basic skills required for operating and administering Linux systems. People who have already written the LPIC 101 exam, as part of the LPIC Level 1 certification. People who wish to write the LPIC 102 exam, as part of the LPIC Level 1 certification. People who are familiar with Linux and wish to acquire more advanced skills and fill the gaps in their understanding. People who want to run network servers on Linux.